It was a surprise addition to the schedule. Minutes later we were skimming towards the hot spot in zodiacs. Trousers rolled up for landing, I began to see the benefits of an “expeditionary” cruise on a smaller ship. I had joined Ponant’s Le Soléal in Singapore for a 12-day voyage through the Indonesian islands to Bali. On day three we dropped anchor in the Sunda Strait between Java and Sumatra. Our schedule had promised a gentle sail around Krakatau’s archipelago – not a visit to the world’s most famous volcano because, as pub-quiz aficionados know, Krakatau is an ex-volcano. After its eruption in 1883 – the most violent volcanic explosion in recorded history – Krakatau collapsed into the sea, creating a massive caldera. All that remains are a few shattered islands and the legend of a bang heard as far away as Sri Lanka. Luckily for visiting vulcanologists, and the local tourist industry, Anak Krakatau, or Son of Krakatau, began emerging from the waters in 1927. Although not as dramatic as the original, it has grown (at an average rate of five inches a week) into a fully functioning volcano. Photos show a full arsenal of eruptive party tricks: fire fountains, streaming lava, spatter bombs and even the odd seismic wobble. The hike up Anak Krakatau was a lesson in geomorphology. After the brief shade of virgin forest, we climbed black slopes punctuated with scorched casuarina and fig trees, plus a few flowering plants that find a home in the fertile lava. On the surface were granite rocks the size of bowling balls hurled from the volcano’s core. Local guides led us to a spot where the fine black lava stopped and a barrier of steaming hot rocks began. Far below, Le Soléal looked like a toy boat afloat in Krakatau’s caldera. It was a fair way down but she was moored close enough to assure us of a quick getaway if Anak awoke. The unscheduled excursion was “typical of the core spirit of Compagnie du Ponant”, explained Jerome Pierre, Le Soléal’s cruise director, over beers in the ship’s Grand Salon. 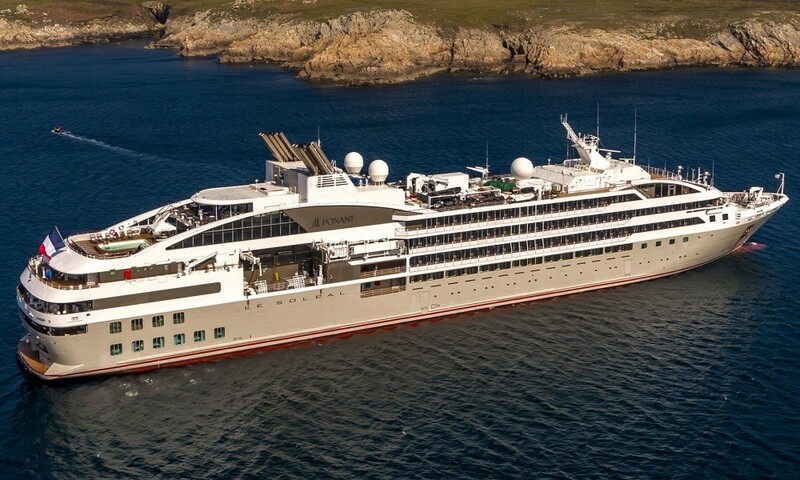 Starting out with Le Ponant, a three-masted luxury yacht for just 64 passengers, the line’s fleet will grow to seven in 2018 (in December Ponant announced the launch of the first LNG-powered electric hybrid cruise icebreaker). The original barque is kept on as the company’s talisman, while mega yachts provide a niche offering for the luxury market. Le Soléal was the first French passenger vessel to navigate the Northwest Passage. It is difficult to associate the harsh discipline of an Arctic crossing with the ship’s interior design. First impressions are of a fashionable Champs-Élysées boutique. Soft leather furniture lends communal areas a chic air, while reception desks in white Corian scream boutique hotel; likewise the well-groomed staff. My cabin offered a refreshing white palette, with a pencil-line motif from shower to balcony giving the look of luxury yacht accommodation. Only the look, I’m afraid, as most materials were faux – leather, veneer wood and plastic orchids. Despite this, interior designer Jean-Philippe Nuel has created a sense of uncluttered elegance. Clearly, what he saved on surfaces he has spent on fittings, with slick designer lighting including the best bedside lamp I have ever seen. 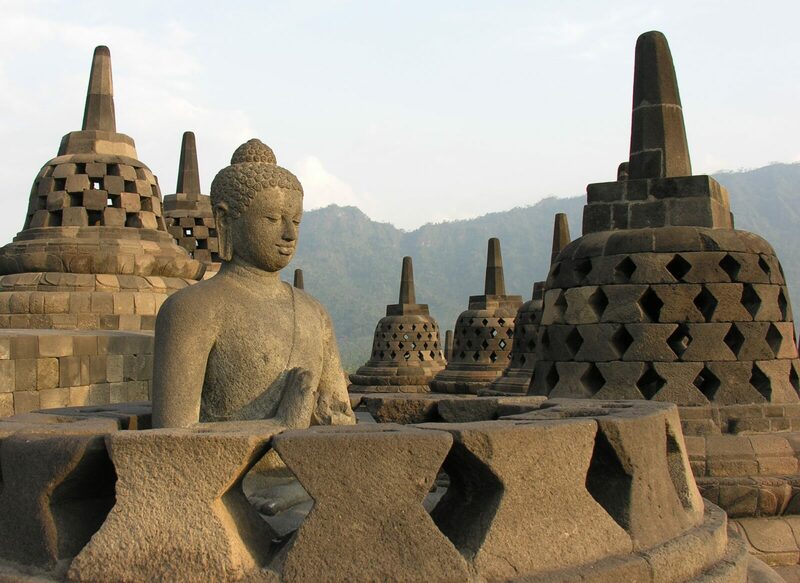 As we sailed east we visited the world’s largest Buddhist temple at Borobudur and the railway system of central Java constructed by Dutch colonists. 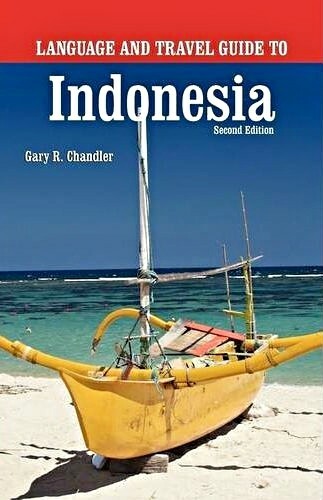 Excursions highlighted the gap between the earthy thrust of Indonesia and the sophisticated languor of life on board. In the busy port of Surabaya, after battling with high humidity, waves of scooter traffic and the frenzy of a morning market, I staggered up the ship’s gangplank to indulge in an air-conditioned pedicure, petits fours and a classical piano recital. Often Le Soléal felt like an exclusive arrondissement of Paris adrift in the South China Sea. This dizzying contrast of cultures reached its height as we approached Komodo Island, home to the world’s largest lizards. “You only need to worry if the dragon swishes its tail,” warned Tajudin, our National Park ranger. Cue tail swish. “Forget the photograph now, madame!” Cue screams and a scattering of passengers as the nine-foot long carnivore began its starting sprint. 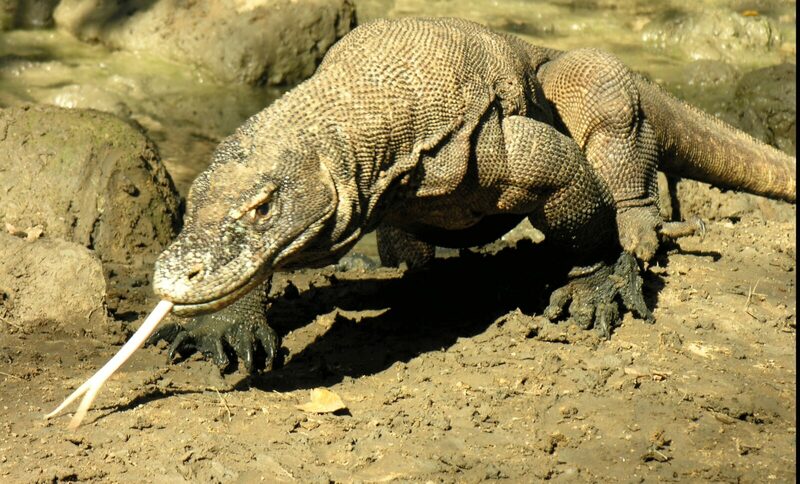 Thankfully, Tajudin had his trusty cleft stick handy and pinned the lizard’s neck before it ran amok. On Komodo it was essential to follow the guide’s flag to stay safe. As we stomped through mangrove forest up to folds of virgin green savannah, there was a genuine nervousness among the group. Basking lizards are the colour, size and shape of fallen trees (and there were many big logs around). Their forked tongues can sense blood up to six miles away; they can swallow a goat whole and eat up to 80 per cent of their body weight in one sitting, yet can exist on just 12 meals a year. Oh, and unusually for lizards, the males are monogamous and have two penises – poor fellows. I was full of cautious respect when we came across two dragons slumbering by a waterhole. In all, we saw five and I enjoyed visiting them in their own habitat rather than staring at caged beasts. On board we prepared for an evening of fine dining and contemporary ballet. Ponant aims to offer a taste of French art de vivre, which included crêpes suzette cookery lessons, illuminating lectures on Indochina from a French perspective, and a few dull PowerPoint talks on wildlife. We were treated to piano recitals, arthouse films starring Catherine Deneuve, and an interpretation of Picasso’s life through contemporary dance that I could have done without. All very highbrow – until Jerome Pierre announced a pirate-themed fancy-dress evening, quizzes and crab-racing. There were French officers and bar staff with Maurice Chevalier accents; gentle spa treatments, and beauty products from a Paris-based salon. Among excellent French wines were surprise vintages from the south of the country.